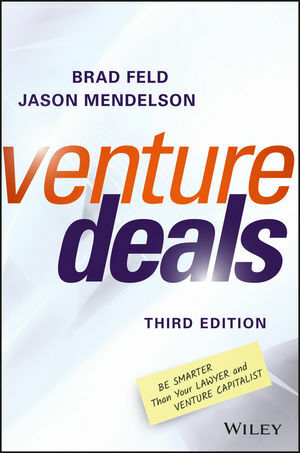 The book “Venture Deals” is co-authored by Brad Feld (from the Foundry Group and TechStars) and Jason Mendelson (also of the Foundry Group). Prefaced by the tag line “Be smarter than your lawyer and venture capitalist,” the book aims to provide a general overview to the venture capital fundraising process for startup founders and employees, lawyers, and other venture capitalists. Overall, I enjoyed reading this book. I read this book coming from a fairly limited understanding of finance and the basics of venture capital fundraising so I felt this book provided a solid understanding of the key players, vocabulary, and issues while also serving as a good reference document for the future. The book is fairly short, including a fairly extensive Appendix with example documents such as terms sheets and letters of intent. It was a relatively quick read and I’m sure I will re-read specific sections, if not the entire thing, again in the future. A significant portion of the book focuses on various aspects of the term sheet, while the remaining sections detail topics such as alternative fundraising options, venture capital fund operations, negotiating tactics, and basic legal guidance. The book gets fairly technical in some portions in order to reinforce key concepts with detailed examples, however, these details aren’t overwhelmingly complex. In addition to the author’s perspective on the fundraising process, they also added comments from Matt Blumberg, CEO of Return Path in separate text boxes called “The Entrepreneur’s Perspective.” These are pretty useful as a summary of the key points and have some valuable additional insight. For the rest of this post, I’m just going to highlight some of the quotes or concepts I found interesting or relevant as I progressed through the book. Some commentary is added where I felt it was relevant, but a lot of the content can stand alone. The passage below is fairly common sense advice, but it’s usually the basics that get overlooked and lead to issues. Subsequent chapters talk about items like the pitch deck and executive summary that should be prepared as well as the motivations of venture capitalists. Still, this was a good reminder of the value in spending time researching the specific firm you are approaching to find out what unique requirements or motivations they may have instead of assuming all firms are the same. The book talked extensively about the role of lawyers in the negotiation process and the impact they can have on both the terms of the deal and the VC/entrepreneur relationship once a deal is closed. All plans change as soon as they are implemented. Therefore, the value isn’t necessarily in the final product. The true value comes from all the insights developed by conducting thorough and detailed planning. Identifying things like planning assumptions, regulatory constraints, and resource limitations are crucial for developing the structure of the plan, which allows you to effectively adapt the plan as the environment changes. I thought the following sections highlighted some important aspects of the business development planning process and how to present that plan to investors. Describing the content of the pitch deck, they recommended addressing the following topics in 10 slides or less. I thought it was good to get this both from a founder who has successfully raised funding as well as from the authors, who are the target audience for these products and have seen a wide variety of formats and styles. While the topics are pretty straightforward, developing slides to clearly and concisely to depict all that information is pretty challenging. “One successful negotiation tactic is to ask VCs up front, before the term sheet shows up, what the three most important terms are in financing for them. You should know and be prepared to articulate your top three as well. If the VCs are pounding hard on a point that is not one of their stated top three, it’s such easier to call them out on that fact and note that they are getting most or all of their main points.